I have never seen a mural before that has the colours popping like this one. It was painted by four artists: Elicser, Chor Boogie, Mediah and Siloette. Mediah and Elicser are both artists from Toronto. Siloette and Chor Boogie are visiting artists from San Francisco. The concept of the wall was for the artists to collaboratively interpret what faith means to them. Commissioned collaboration piece through Well and good and Wonder Cafe, along with the United Church of Canada. 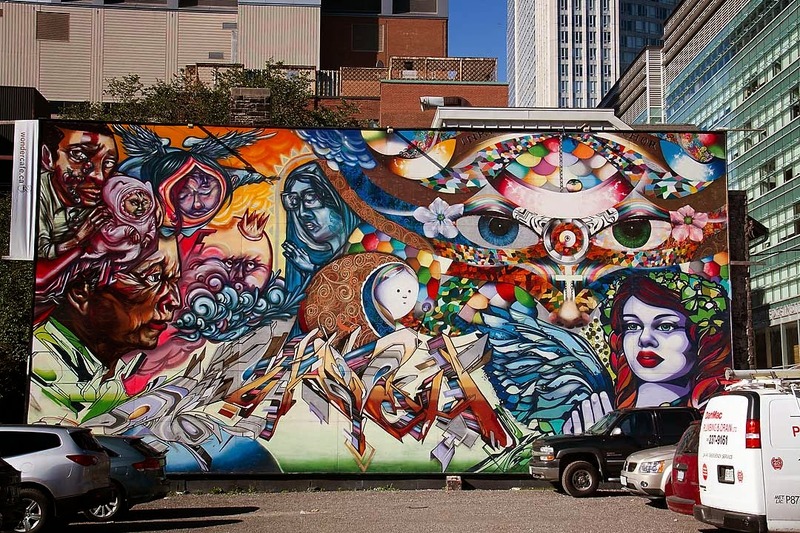 The mural is an integration of faiths and beliefs by the artists. I'm linking to Monday Mural. It takes you some time to see what is all going on here, amazing. You're right about the colors! Bold and bright! The concept of faith and beliefs are somewhat mysterious, too. First thing I thought was, "What a wide variety of styles!" Now I know why. I think it's a wonderful project. I'd rather have something positive and uplifting than skulls, daggers and what-have-you. Amazing! will have to check it out. Wow - a lot going on in this mural! But it is colorful and I'm sure brightens up the area. what a great piece, very vivid! Wow, Andy! This is a good one, I've never heard of the Garden District though. Trying to figure out where this is. certainly a striking mural; strong colours; great find Andy. There is also a Toronto, just 25 kms from me! Except for the cross below the eyes, can't say that I've been able to figure out any other religion or faith portrayed. I confess to ignorance. But I like the energy the mural conveys. Thanks for contributing to this week's Monday Mural. Until I read your explanation and really looked at the photo I had no idea what this mural is all about. Thanks for explaining it, Andy! such a great outlet for artisic self expression!! bold and colorful....knowing the message does help one inturpret it! !